Obsidian is a volcanic rock that cooled so fast that the minerals contained within it did not have time to crystallise. It is a naturally occurring glass. All obsidians are powerful grounding and protective stones. 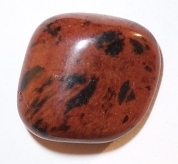 Mahogany Obsidian increases one's sexuality and sensuality, helping one to feel sexier and more "in touch with touch".